1st VIC - Bow: A R Stackpole, 2: Arthur Nicolls, 3: J L Irvine, 4: J Booth, 5: William H Tuckett, 6: Robert D Booth, 7: R Brown, Str: George E Upward, Cox: Fred J Edwards. Average weight 11st 5lb. 2nd NSW - Bow: John Thompson, 2: Edward P Simpson, 3: Martin L Zollner, 4: Charles A Bros, 5: Francis Henry Woodriff, 6: Charles W Gaden, 7: William G Anslow, Str: A Peter Stewart, Cox: Aaron Yates, Cch: Jim Clark. Average weight 10st 10lb. Before a crowd of 15,000 spectators, a stronger and heavier Victorian crew won by only three lengths in a good race. 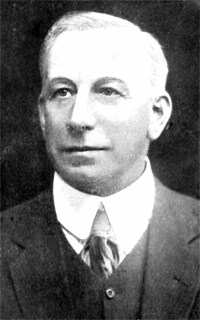 The Victoria stroke, George Upward, was very influential in keeping Intercolonial competition going by boating sanctioned, but not official Victorian crews, despite the amateur issue not being resolved with NSW. He was a very influential rowing administrator. 1st VIC – Bow: Frederic G Hughes, 2: J Booth, 3: J L Irvine, 4: Robert D Booth, 5: H Hopkins, 6: William H Tuckett, 7: R Brown, Str: George E Upward, Cox: Walter Bray. Average weight 11st 13lb. 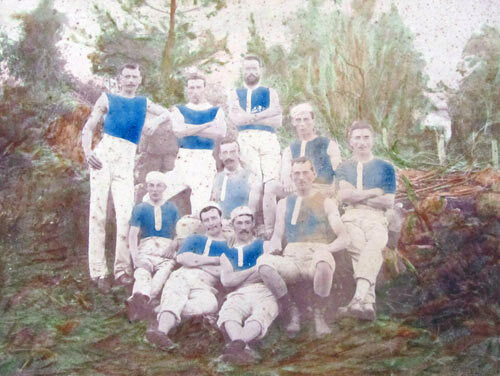 2nd NSW – Bow: Charles A Bros, 2: Charles W Gaden, 3: John Arthur, 4: W (Bill) G Brett, 5: William G Anslow, 6: Charles S Salmond, 7: Alex Finlayson, Str: David Lord, Cox: Walter WFoster, Cch: Jim Clark. Average weight 12st. "Both crews tried and discarded swivels, relying instead on poppets. The crowd of 5,000 odd, including the Governor, was to be disappointed in the race itself. Victoria led from start to finish and won by about 30 seconds over the Championship course. Experts considered their style not individualistic like that of the NSW oarsmen: the Victorian rowing 'was from end to end, as one piece of beautifully adjusted machinery'. "Several members of the NSW crew also tired badly during the race. Some disruption to the big event was caused by steamers and suggestions were soon made that a move to the Nepean be considered for the next clash." 1st NSW – Bow: Nick Johnson, 2: R Moppett, 3: Edward P Simpson, 4: Charles A Bros, 5: J Andrew Brodie, 6: Charles W Gaden, 7: Rupert Bedford, Str: John Thompson, Cox: Aaron A Yates, Cch: James Oatley. Average weight 10st 6lb. 2nd VIC – Bow: William W Senior, 2: Frederic G Hughes, 3: C Brown, 4: Robert D Booth, 5: Frederick C Ankerson, 6: William H Tuckett, 7: D M Beynon, Str: George E Upward, Cox: Walter Bray. Average weight 11st 11lb. NSW led all the way to win by 1 1/2 lengths. The stroke man John Thompson weighed only 9 stone 2 pounds or 58 kilograms. The crew, for reasons unknown, were known as the Rats Crew - Referee 3-4-1918 p.10. 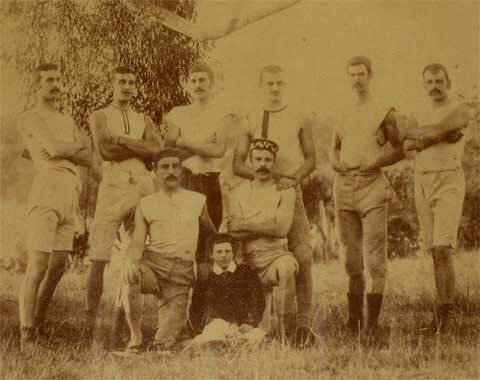 The average weight of the NSW crew was 10st 6 1/2 lb and the Victorians 11st 12lbs. The seven man Rupert Bedford (and four others) were blown up by a submarine mine near George's Head Sydney Harbour on 3rd April 1891. 1st VIC – Bow: T D Brown, 2: William W Senior, 3: W J Leverett, 4: J D Webster, 5: W Douglas, 6: W Burnip, 7: T Graham, Str: George E Upward, Cox: Walter Bray. Average weight 11st 3lb. 2nd NSW – Bow: D D Middleton, 2: R Moppett, 3: Edward P Simpson, 4: Charles A Bros, 5: J A Brodie, 6: George J Robertson, 7: Rupert Bedford, Str: John Thompson, Cox: A Yates, Cch: James Oatley. Average weight 10st 5lb. The Victorian crew was largely revamped following the loss in the previous year. The crew proved to be a stronger and faster crew than the NSW crew. It also appears that there was some reluctance by some NSW oarsmen to make themselves available for the crew. The promising young sculler Middleton joined the NSW crew. 1st VIC – Bow: F J Taylor, 2: William W Senior, 3: William J Leverett, 4: Frederick C Ankersen, 5: W Douglas, 6: F G Hughes, 7: W Burnip, Str: Robert D Booth, Cox: Walter Bray. Average weight 11st 2lb. 2nd NSW – Bow: Nick Johnson, 2: T Frederick Walker, 3: George Searle, 4: H B Pickering, 5: R Bourke, 6: Charles W Gaden, 7: J D Webster, Str: S H Martin, Cox: S Chate, Cch: James Oatley. Average weight 10st 13lb. It is reported to be a great race even though Victoria led all the way but finished only 1/2 length in front at the end. The NSW crew contained 2 Sydney members, 3 Mercantile members and representatives from Balmain and North Shore. 1st NSW - Bow: Nick Johnson, 2: R Moppett, 3: George Searle, 4: Edward P Simpson, 5: J A Brodie, 6: J Edward H Kennedy, 7: Sam H Martin, Str: Charles A Bros, Cox: E Benson, Cch: James Oatley, Emerg: C Dobson. Average weight 10st 13lb. 2nd VIC – Bow: E R Ainley, 2: F J Taylor, 3: W J Leverett, 4: F Gregorson, 5: C A Champion, 6: S H Gowdie, 7: T Graham, Str: William W Senior, Cox: Norman Young. Average weight 11st 3lb. 3rd TAS – Bow: W H Cundy, 2: John Todd, 3: H A "Cuss" Westbrook, 4: H Ben Stuart, 5: Audley Mervyn Stuart, 6: Erskine T Watchorn, 7: Thomas Robertson, Str: Alfred Fullarton Sharland, Cox: W Burton, Emergs: P Crisp & J Todd, Cch: Frank Norman accompanied and assisted the crew. Average weight 11st 2lb. 4th QLD – Bow: John "Jack" N Devoy, 2: Ernest Baynes, 3: T A Bond, 4: L J Quinn, 5: Dennis O’Connor, 6: P Hardgrave, 7: Tom Hughes, Str: Ernest Winter, Cox: Mark Harris, Emerg: George Markwell. Average weight 11st 5lb. Victoria led early but were passed by NSW. "Tasmania had given indications of wishing to compete in the 1883 race, but 1885 was the first occasion on which Queensland had shown interest. A request had been received from South Australia soon after a rowing association was formed in that colony in 1881 – but for an entry which would include manual labourers. They were told they were most welcome with a crew of bona fide amateurs but, as this would have rules out many of their best oarsmen, South Australia declined to compete." May also reports that all boats used in this race were built by either Melbourne boat builders Green or Fuller. Jack Pritchard in his book Queensland 1880-1995 also reports that the Tasmanian crew used an eight fitted with a fin, the first time one was used in an eight. The Brisbane Courier on 17th January 1885 page 5 reported that the crew differed from that noted above, probably due to changes post selection. P Hardgrave withdrew as the training times did not suit him and was replaced by Hughes. McIntoch was replaced by Bond (19 February 1885 and Bond withdrew and was replaced by Phelan as he could not get leave - 28 March 1885.